Like other flora in Japan, the diversity of trees here, especially in the southern forests, is inspiring. This is due to a variety of reasons. First of all, rainfall is plentiful and the soils are rich such that most areas have been historically forested. The varying elevations as well add to diversity, particularly in the south where forest type varies from nearly subtropical to cool temperate, since many microclimates exist because of them. Third, due to Japan’s extensive north to south latitudinal reach the species found here range from truly boreal to truly tropical and everything in-between.Human influence on forests has been extensive. Lowland forest in particular is nearly gone, therefore virtually all of the forested area is in the mountains. This fact is born out in statistics: approximately 73% of the nation is mountainous and about 67% is forested. The similarity of these numbers isn’t a coincidence. Generally speaking mountain areas are not built on since they tend to be unstable, so the mountains here are more or less usually forested.A country that is 2/3 forested sounds quite impressive, especially considering that this small nation also has nearly 130 million permanent human residents. The truth of the matter is that much of this forest is not natural, but rather cut over and planted in specific lumber trees. In the south sugi (Cryptomeria japonica) and hinoki (Chamaecyaris obtusa) are the main species used for this purpose and their plantations often make up the bulk of the forest on any given mountain. These plantations are composed of same age trees that are usually not allowed to grow very large before being harvested. Additionally, such forests lack biological diversity being unsuitable for most plant species and therefore are not good habitat for many animals either. The sad truth is that only about 1% of Japan’s forests can be considered primeval, old growth.The forests of Kyushu, Shikoku, and half way up the coasts of Honshu are home to the northernmost extension of southeast Asia’s broad leaf evergreen forests. Here the forests are dominated by species from the beech family (Fagaceae), the laurels (Lauraceae), and the Asterids (Theaceae). Numerous other trees are represented here as well, including conifers and a wide range of deciduous trees, but often they are in the minority. The feel of the forest is very nearly subtropical, but this far north these forests are in warm temperate climes. Typical genera found here include Quercus (subgenus Cyclobalanopsis), Lithocarpus, Castanopsis, Cinnamomum, Machilus, and Camellia. Since this is the forest region I live in and have most examined, many of the trees treated here will be from this forest type. Fortunately, I happen to live near lovely examples of old growth forest, albeit small remnants. One can only wonder at the forests of old – they must have been breath-taking. Japan is home to many iconic plants, for example the Japanese plum tree (Prunus mume), and the red spider lily (Lycoris radiata). The odd thing is that neither of these species is native to Japan, but rather are imports from China. 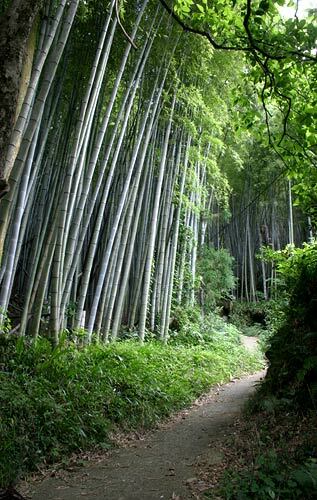 Moso bamboo (Phyllostachys edulis), another Japanese icon, shares their fate. If that weren’t enough, being in truth a very large grass, moso cannot be considered a tree either, despite its arboreal size. Regardless of these facts, moso remains the most important timber bamboo in the world, and has a central role in Japan’s traditional culture, ranging from construction material to food. Phyllostachys edulis is a large growing bamboo with stems (called culms) routinely attaining heights of 15 meters or more, indeed reports of culms approaching even 30 meters exist in its most favored habitats. Being a “giant” or “timber” bamboo, culm diameter can be impressive, up to 20 cm, but as little as 8 cm in weaker culms. Moso growing along a mountain path in Fukuoka Prefecture, Kyushu, Japan. Impressive stands of this giant bamboo are common place in the warmer parts of Japan. Like other bamboos, the nodes on the culm are very easy to see, forming a segmented stem that is hollow inside except at the node itself. The culms are not tapered, but rather columnar in structure, only tapering near their apex. The uppermost nodes have one or more side branches that in turn bear the numerous elegant, small leaves. Culms fully mature within two seasons growth and can last up to 12 years. The paper thin leaves are plentiful and last one growing season, each usually 4-10 cm in length and less than 2 cm in width. In Japan they turn yellow all at once in May and are shed in time with new culm formation. The bright green, new leaves on the old culms grow quickly and are fully developed by June. Branching on the old culms becomes more intricate over time, hence more and more leaves are held by any given culm as they age, thus increasing their beauty and photosynthetic potential. The culms originate from underground shoots that are born off a highly complex mat of segmented rhizomes that tend to grow fairly shallow in the substrate, typically not more than a half meter deep. On moister sites it is not uncommon to see them growing along the surface of the ground here and there. These rhizomes are stolon-like, extending in all directions, thus making this a “running bamboo” species. The white roots too, are numerous and strong. New growth shoots break ground in spring once the average air temperature reaches 18-20 C, usually in mid to late April in southern Japan. At first they grow slowly, but once they attain a height of 1 m or so, they rocket into growth, literally. It is well documented that this species is one of the fastest growing plants in the world, having been “clocked” at 1.2 meters of growth in just one day! The leaves of Phyllostachys edulis are paper thin, small, and numerous. They hang from graceful arching branches. The emerging shoots are covered in alternating, hairy dark brown sheaths that are tipped with green, leaf-like projections. These sheaths cover the developing culm as it rockets upward, but just as quickly are shed, starting from the bottom most segments, revealing the new blue-green culm underneath. Remarkably, the culm is fully grown within 5-6 weeks and will begin to harden off, a process that takes more than one growing season. It will never get any taller or thicker however since its anatomy has no means to do this. One has to remember this is indeed a grass, not a woody plant. Japan is famous for three pine species, Japanese black pine (Pinus thunbergii), Japanese white pine (Pinus parviflora), and Japanese red pine, (Pinus densiflora). 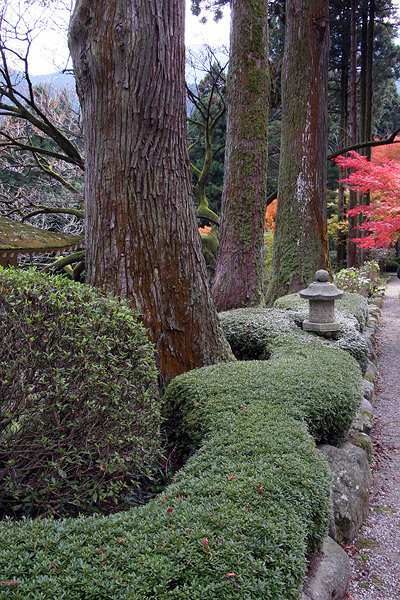 The focus of this article is on the latter species, that like its cousins, is an iconic plant in Japan, used in traditional gardens as a dwarfed tree, but more rarely as a bonsai subject. Moreover, since its wood burns very hot, it makes a great fuel for pottery kilns, and has been used in construction for its durability, strength, and lightness. It is closely related to the Eurasian mainland species, scots pine, Pinus sylvestris. Pinus densiflora is a tall pine species, growing up to 30 or more meters high. Pinus densiflora is a large coniferous tree growing to 35 meters, but is usually much smaller, not more than 20 meters or so. Specimens found on moister sites with richer soils grow to large sizes and their straight, red barked trunks are unmistakable from a distance. Trees found on cliffs, rock barrens, or dry ridge lines with impoverished soils are far less stately, often standing no more than a few meters tall. The bark is a bright orange-brown color and peels off in paper-like sheets except older bark low on trunks which forms into plates and is silver-gray . The evergreen needles come two per fascicle (or bundle), are a dark green, and up to 12 cm long. Branching is tiered and up swept, forming a distinct, elegant look. Pollen cones appear in early spring, are conical and elongate and orange-yellow in color. The seed cones start at the same time and are yellow to purple in color. These female cones mature by fall and are small, not more than 6 cm long, occurring alone or in clusters. The winged seeds are about 1.5 cm long. This is a widespread tree in Japan found from northern Honshu and southward to Kyushu and Shikoku. 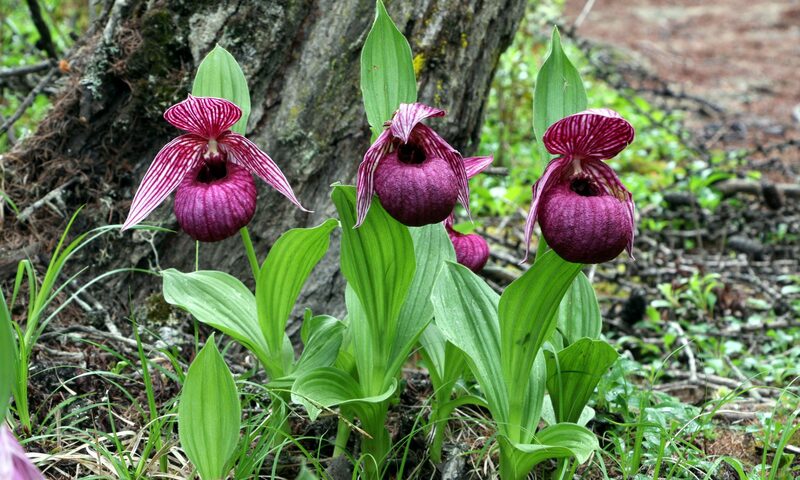 It is most commonly seen growing in low mountains and hillsides, but can be found up to 2500 meters elevation in parts of its range. Its typical habitat are dry ridge lines with poor soils that have been subject to recent disturbance as this is a colonizing species, and is usually one of the first trees to seed in after a fire or other disturbance. For this reason, you often see near pure stands of it here and there, no doubt due to forest fire. I’ve noticed it also colonizes abandoned mines on shear cliffs alongside other weedy pioneer tree species such as Mallotus japonicus and Rhus sylvestris. It is believed that in times past it was much more uncommon a plant since disturbance due to fire was very limited prior to human habitation. It is one of the few trees than can withstand growing in windswept rock barrens. The younger bark is a brilliant orange-brown color, but older bark found lower on trunks is silver-gray and forms plates. Where this species is found in mixed stands with Japanese black pine, Pinus thunbergii, the unusual hybrid called akakuromatsu (red-black pine) sometimes results (known under the Latin name. P. x densi-thunbergii). These hybrids have the red bark of P. densiflora while retaining the darker, more stout needles of P. thunbergii. 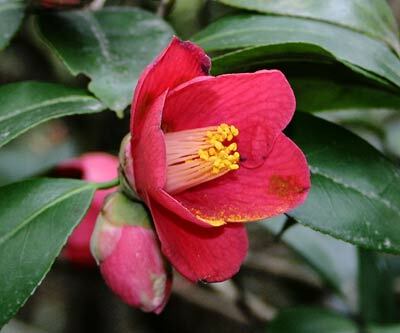 A member of the tea family, Theaceae, Camellia japonica is one of Japan’s most famous flowering trees. Known as tsubaki in Japanese, this plant is a common small tree throughout the warmer regions of the Japanese archipelago. 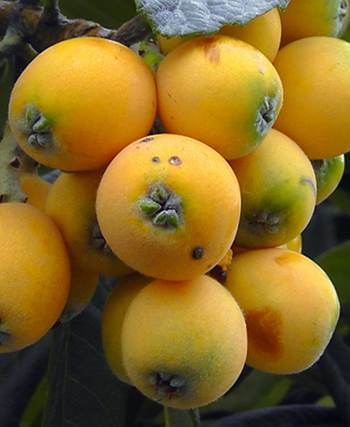 In recent times it has been widely cultivated as a garden plant, but in the not so distant past the oil derived from its bulbous fruits was used as a multipurpose product, serving as a food, a hair and skin treatment, as well as a machine oil. 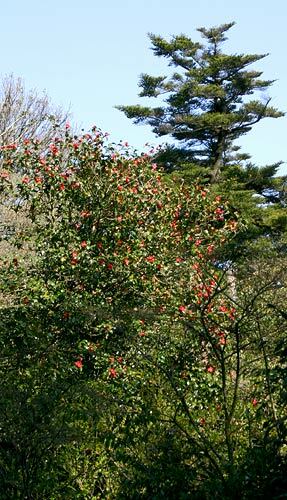 Camellia japonica is most commonly seen as a sub canopy tree, but occasionally specimens grow in open, sunny habitats such as this ridge line forest. Homanzan, Fukuoka Prefecture, Kyushu, Japan. Camellia japonica in nature is an evergreen subcanopy tree, commonly 3 to 6 meters tall, with occasional specimens being quite a bit higher than that. The tallest on record is 18 meters (that’s almost 60 feet!). I’ve seen many in the 10-12 meter range with trunk diameters approaching 60 centimeters in really large trees. 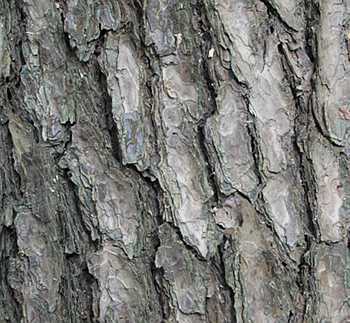 The bark is an even gray color and very smooth. The wide, slightly serrated ovate leaves are borne in an alternating pattern and typically measure between 5-10 centimeters long and 3-6 centimeters wide, ending in a pointed tip. They usually are a deep green color on their dorsal surface and a bit lighter underneath. The dorsal surface is also very glossy, adding to the visual appeal of this plant. 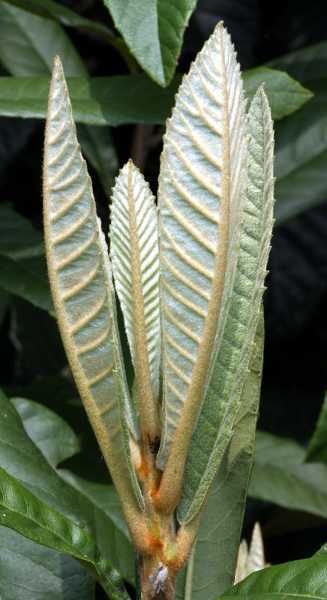 The soft, new leaves are most actively in growth after flowering in the spring. 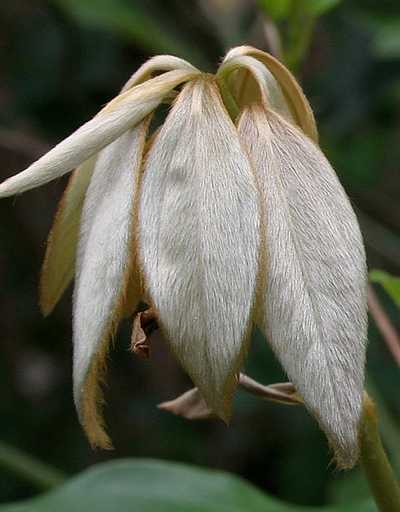 Flower buds are formed in the fall and over winter until opening in late winter or early spring. The flower petals of wild plants are typically deep red, though pure white forms have been reported. They are joined at their bases such that when the flower falls off, it is intact (we’ll see why that is important later). The prominent cluster of stamens are a yellow orange color while the three lobed pistal is “lost’ in them. Wild flowering types commonly boast only a handful of broad petals and the blossoms tend to remain rather cupped compared to many of the cultivated varieties. The fruits are nearly perfectly round before opening, starting out apple green and maturing into a purple-red. They open in three sections (called locules), each containing anywhere from 1-2 large brown seeds. 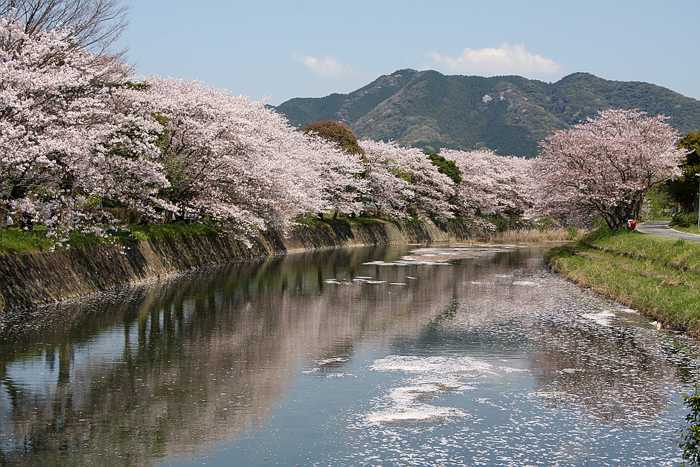 Flowering season in southern Japan starts in winter, usually not before January, peaks around March, and trails off in late April. At higher elevations flowers can persist even into mid May. 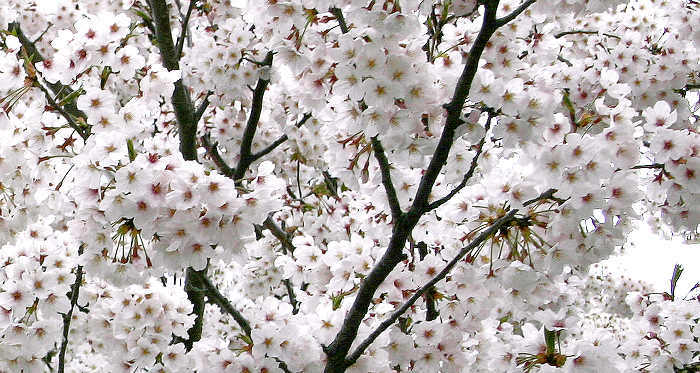 Flowering is later further north, and can last into mid spring, however, it is not uncommon to see this tree in flower when snow is still falling. This cold weather flowering habit has earned it one common name, rose of winter. Due to the relative lack of insects in winter, the flowers are often pollinated by small birds, in particular the Japanese white-eye, Zosterops japonica. The flower of the common wild type of Camellia japonica is much simpler than most cultivated forms, but lovely and elegant. 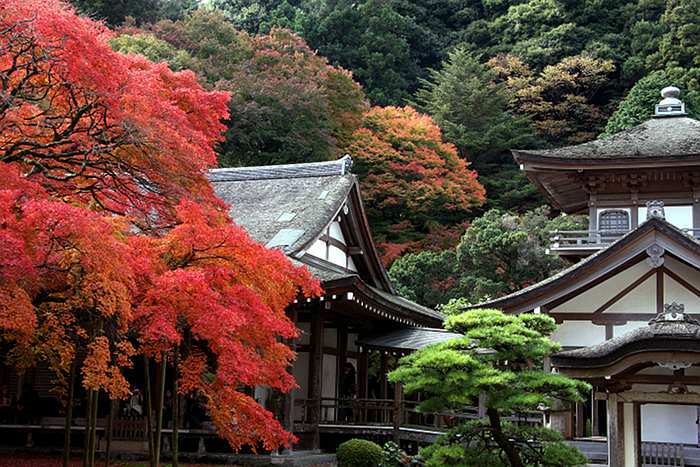 Japan’s southern and coastal regions are home to the northernmost occurring examples of Asia’s laurel forests. Here the climax forest community is dominated by trees in the laurel family (Lauraceae), evergreen members of the beech family (Fagaceae), as well as the tea family (Theaceae). Neolitsea sericea is a common laurel tree found in these temperate evergreen forests. It is a remarkable tree in many respects, especially its foliage, as you will see. Neolitsea sericea flowers in the autumn just before the cold weather hits. 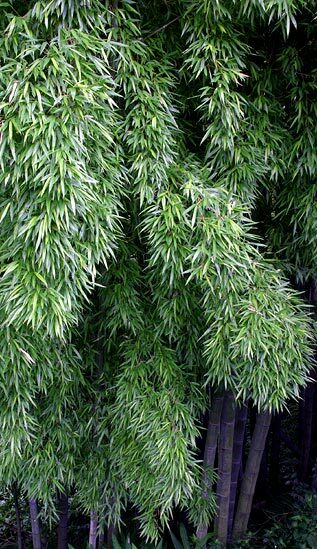 Neolitsea sericea is a moderate sized broad leaf evergreen tree, attaining a maximum height of 10-15 meters. Unimpeded, it forms a rounded crown, but rarely is it seen outside a forest setting in Japan where it must compete for light and therefore usually has a more ranging form. Trunks usually don’t exceed 60 cm in diameter and the relatively smooth bark is brown. Its mature leaves are lanceolate and oblong, 8-18 cm in length, and dark green with 3 prominent lighter green veins along their length. When young they form in a whorl and hang down almost vertically. At this stage they are covered in an extremely shiny, soft velvet like hair that in truth is a muddy yellow green, but gives the impression of brilliant silver in the spring sun. To the touch they are soft, like velvet or silk. Within a few weeks these hairs shorten to a light pubescence as the leaves mature and take on an extraordinary dark pink to reddish purple coloration throughout. The prominent veins of the leaves are almost white at this stage in development and the leaves are more staggered along the newly forming twig in an alternating pattern. By early summer they mature, losing the pink color and all pubescence. What is left is a stiff, glaucous mature leaf. The underside of the mature leaf is a nearly white/green, hence its Japanese name shirodamo, meaning “white ash” – a reference also to the Japanese ash tree, Fraxinus mandshurica v. japonica. In mid fall, just before colder temperatures hit, buds along the newly formed leaf axes open into masses of yellow green flowers. 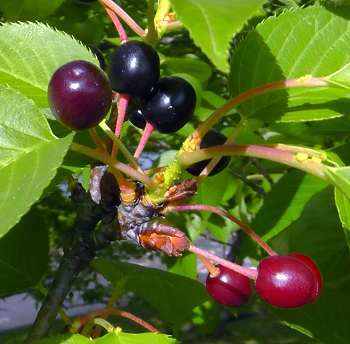 These form into berries over the winter months, remaining green throughout the following growing season only to turn deep crimson the following fall. They are very conspicuous and remain on the tree most of the following winter. N. sericea is dioecious, with male and female trees. Since only the females bear fruit, that must be considered if you want to have fruiting trees. The newly forming leaves of Neolitsea sericea grow in whorls and are covered in soft yellow-green hairs. Along the coastal beaches and low mountains of Japan lives a stout and elegant pine species, Pinus thunbergii. This iconic Japanese tree is known for its beauty as a garden specimen, as a bonsai subject, and also a protector of coastline communities throughout the country. It also is well known the world over as Japanese black pine, a versatile and resistant tree, but also a plant with disease issues. 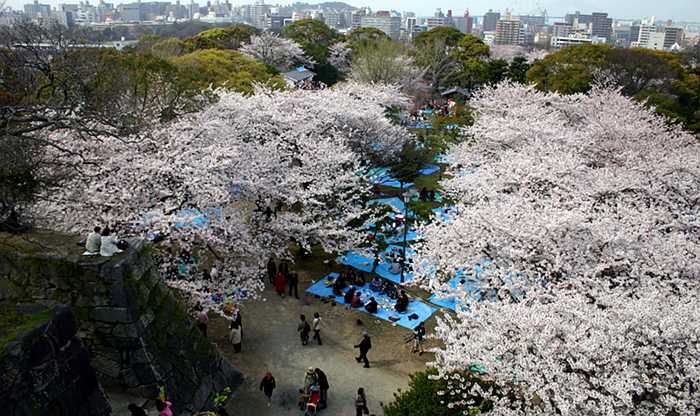 It is a lovely tree regardless, and Japan’s gardens and coastlines wouldn’t be the same without its resolute presence. 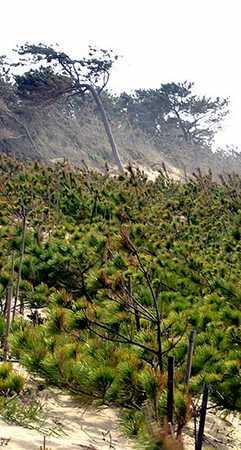 Japanese black pine seedlings planted by the thousands are a common sight along Japan’s seashores. 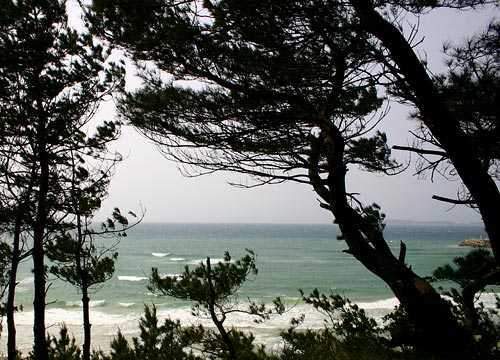 Pinus thunbergii is a large coniferous tree growing to 40 meters under good conditions, but is usually much smaller, particularly when growing on beach dunes, a common habitat for this tree. Specimens found at some Japanese shrines can be even taller with the tallest on record being an incredible 66 meters! This tree often sports a broad dome shaped crown on very old specimens. The bark is silvery to black and deeply fissured. The evergreen needles come two per fascicle (or bundle), are a dark green and up to 12 cm long. Healthy trees are densely needled and bushy looking, especially when young. Pollen cones appear in early spring, are conical and elongate and orange-yellow in color. The seed cones initiate at the same time starting out a rich magenta, and grow in size as they mature over the summer and are nearly round at maturity. Seed is released in winter. 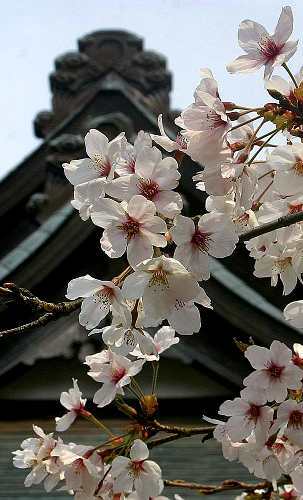 This tree is widespread on or near the coasts of the warmer parts of Japan on Honshu, Shikoku, and Kyushu islands. It is also found in South Korea. It grows most commonly along seashores starting just behind the newest line of dunes and extending inland for a kilometer or more forming the bulk of the canopy of such forests. More inland it prefers rock outcrops and dry ridge-lines in the mountains up to a 1000 meters or more elevation. On occasion it occurs on dry rock barrens in the mountains. Where this species is found in mixed stands with Japanese red pine, Pinus densiflora, the unusual hybrid called akakuromatsu (red-black pine) sometimes results (known under the Latin name, P. x densi-thunbergii). These hybrids have the red bark of P. densiflora while retaining the darker, more stout needles of P. thunbergii. Pinus thunbergii growing on the tops of dunes are typically shaped by the persistent winds. This is the famous Japanese black pine tree that has been planted throughout much of the temperate world. Historically it was an important lumber species, but these days forests are highly diminished in size, so they are rarely used for building material anymore. It’s wood was traditionally used to build shrines in Korea in particular.